The Toby Wallace have achieved 80 miles in 24 hours. This is slightly under record pace. But like the girls before their steering issues, they already have some extra miles in the bag. So if they can find just a few miles more in coming days, their target will be achieved. Thanks to John Hughes (Iwan’s father) for sending some pictures he touch just prior to Toby Wallace setting off. We hope to show you more pictures in the coming days. Weather – still looking good. The Fire Ant girls are making good progress once again. 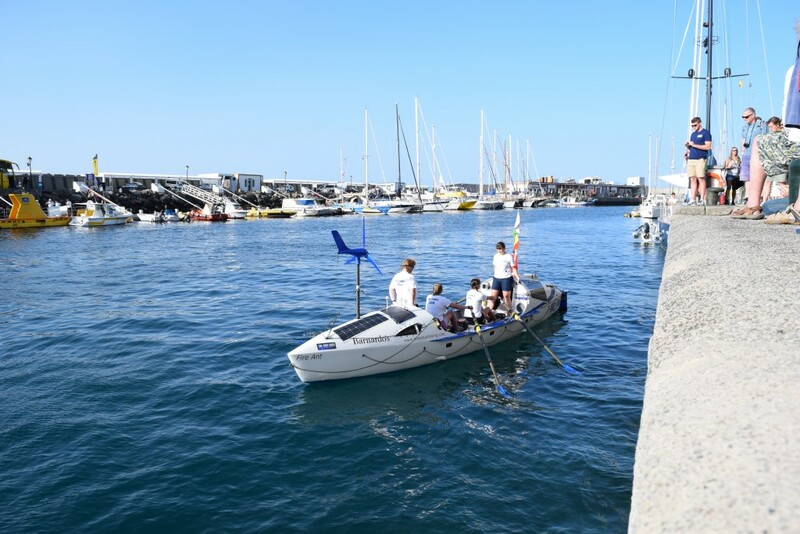 Before this, even with steering issues, they still managed a respectable 40 Nautical miles in the 24 hours period to 10am. We expect a significant increase in this distance in the next 24 hours. Toby Wallace has slowed a little in lighter weather conditions, but expect to pick up a bit more speed tomorrow. 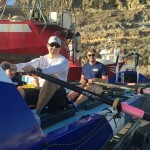 Even with slowing, the boat is still further west than it has been in any of its four previous record attempts. The weather still looks very good for both crews, with everything going in their direction at a reasonable pace. The girls on Fire Ant continue their slow progress as they still have some steering issues. They continue to work through the problem and we hope they will be back up to speed very soon. Avid dot watchers will notice the girls on Fire Ant have been moving quite slowly overnight. This is due to them deploying a drogue during a maintenance period and quite sensibly deciding not to retrieve it during darkness. At first light they will complete their maintanence work, pull in the drogue and hopefully start to speed along again. Sea conditions have lightened for both boats and are likely to lighten further tomorrow. 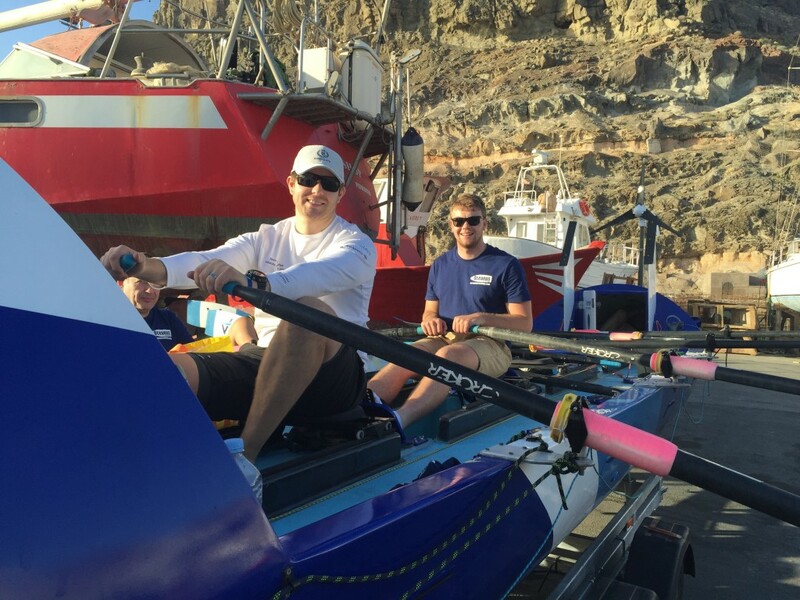 Toby Wallace have made 87 nautical miles toward Barbados in their 3rd 24 hour period. Fire Ant’s distance made good is 32 Miles distance made good. Unfortunately the drogue has done just what it is made for, it slowed them down. We expect better results tomorrow. Another 24 hours at sea and once again good progress for both crews. Fire Ant is another 70 nautical miles closer to Barbados and The Toby Wallace have moved 91 Nm closer to the finish. The Toby Wallace Daily Statistics page is now live. 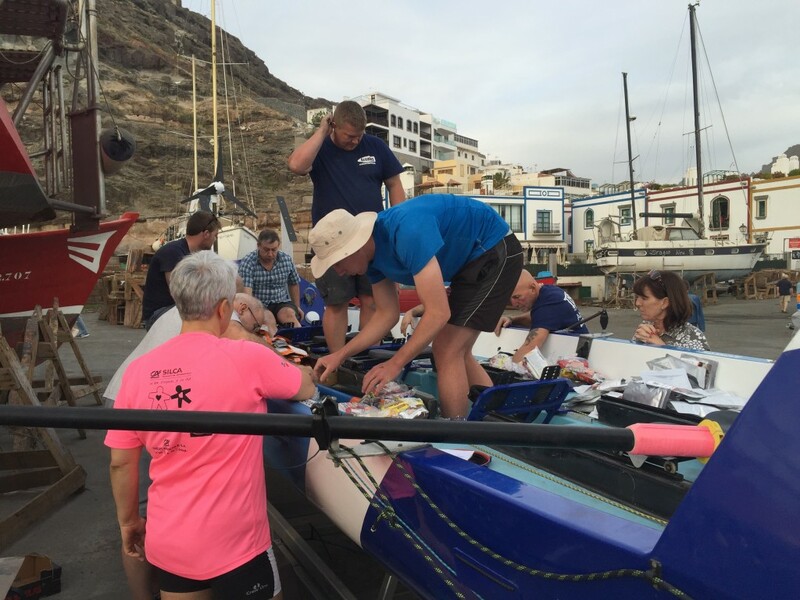 The Girls on Fire Ant have been learning just how fast an ocean rowing boat can go. They spent some time surfing the boat down waves and achieved a very impressive speed of 16 knots on one run. As the crew gain experience it becomes a real pleasure to surf the waves and a very effective way to advance towards Barbados. Yesterday the wind moved fully to the east and increased in speed to 25 knots for both crews. This will have made life on board a little wet for a while. The wind has now eased and will continue to drop on Monday. It remains to be seen what affect this has on boat speed. 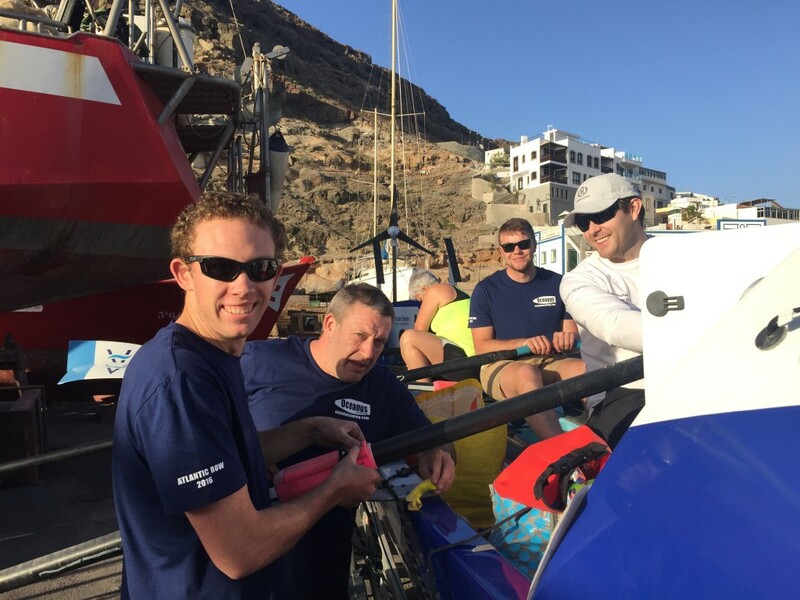 Members of both crews have experienced some sea sickness in these early days of the row. Both Gemma on Fire Ant and Simon on Toby Wallace had to end shore support calls promptly – to feed the fish! 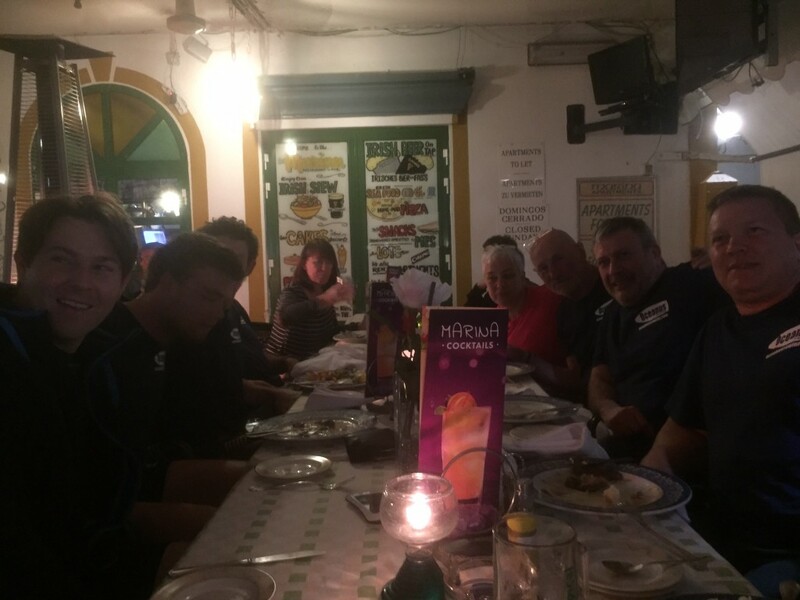 Gemma and the Fire Ant crew are now over their sea sickness and the remainder of the Toby Wallace crew should get over it quickly in the lighter conditions. Both crews are enjoying messages from home. Whilst they can not reply directly to every, they send their regards to all. Please keep up you message posting. With both crews on the water there are even more dots to watch. Go to each boats follow the crew page to see where they are. We do not currently have a means of overlaying the dots for Fire Ant and the Toby Wallace onto the same chart, but fortunately our friends on the French crew that set out just after Fire Ant do. Follow this link: http://www.rameocean2016.com/blog/ to see the maps. 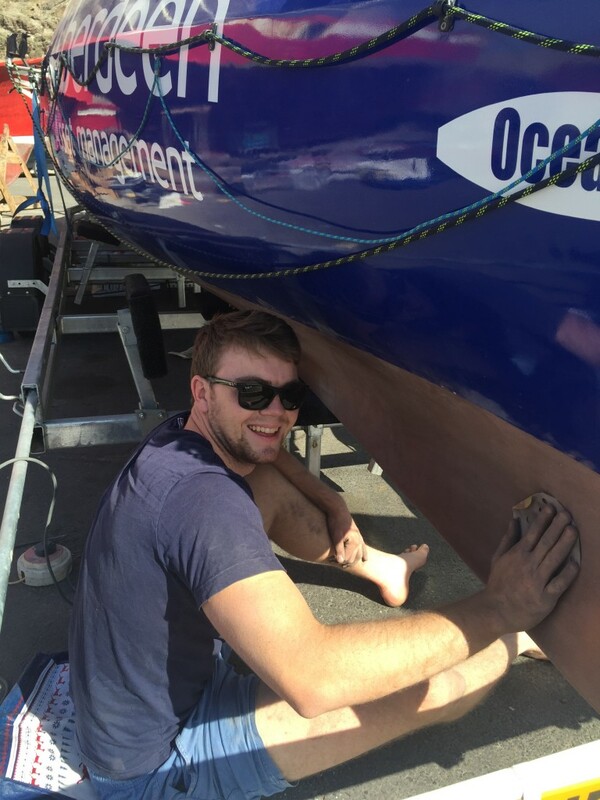 Anyone who reads French, or has a web browser that can translate will read the Rame Ocean 2016 site suggests the French at slightly in front of our girls. 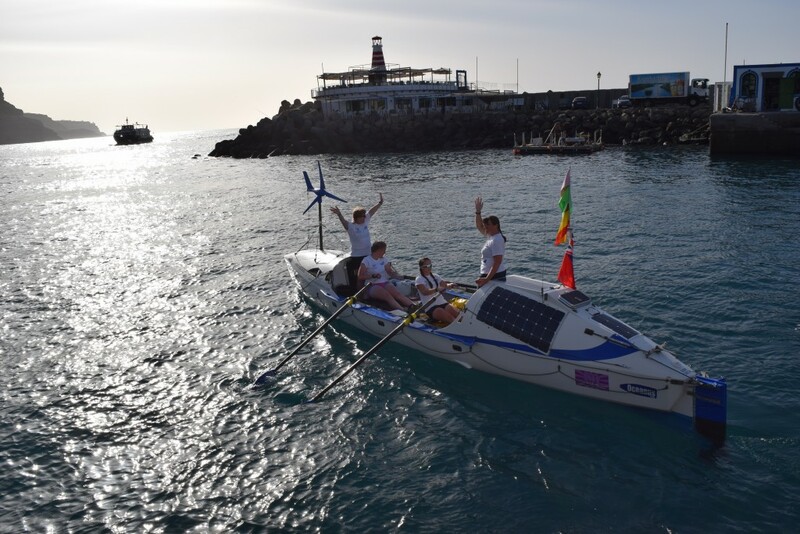 I believe the truth of the matter is the French have rowed slightly further, but the girls are taking a more direct route, and are therefore closer to the finish. We know who is in front! The French intend to finish in Guadeloupe, which is North of Barbados. So at some point the two boats tracks will cross. The progress of the girls has been even more impressive given the fact they had steering issues for two days after the first night out. With guidance from shore support the girls were able to diagnose an issue with the steering ram and replace the damaged section from spares. This has boosted the girls already high spirits. Toby Wallace are now into their second daylight period at sea. 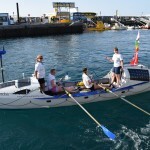 Their first 24 hour distances 82 Nm (79 Nm DMG) whilst slightly off record pace is still very respectable. 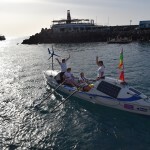 Shortly after the start the crew experienced wind against them, possibly due to wind eddies behind Mount Teide on Tenerife. Now the crew are settled in and passed most of the local effects of the island, we should se more representative distances over the coming days. 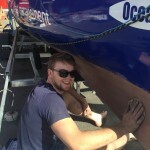 Spirits are also high on the Today Wallace and they have also had some steering issues, which are now fixed. I will add a daily statistic table to their tracking page when they have multiple days on the log. Thanks to all of those who are posting comments for the crews. We really enjoy hearing from you. Coming up in future news posts (maybe): More progress reports, News about crews, a word from our sponsors and charity link. 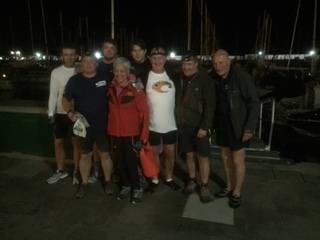 At exactly midnight on Thursday night the Toby Wallace touch the marina wall at Puerto De Mogan, Gran Canaria and headed out on the latest trans-atlantic record attempt.Many thanks to all of those that braved the darkness and late hour to come out and see them off. Initial pace was leisurely as the crew settled it, but just after 6am the boat arrived at the acceleration zone. This is an area of faster wind and waves pushed through the gap between Tenerife and Gran Canary. 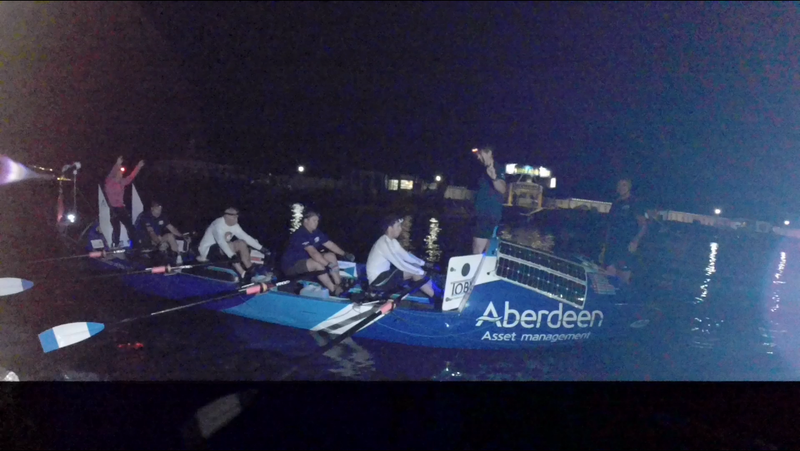 The boat and crew are now travelling well over record pace. 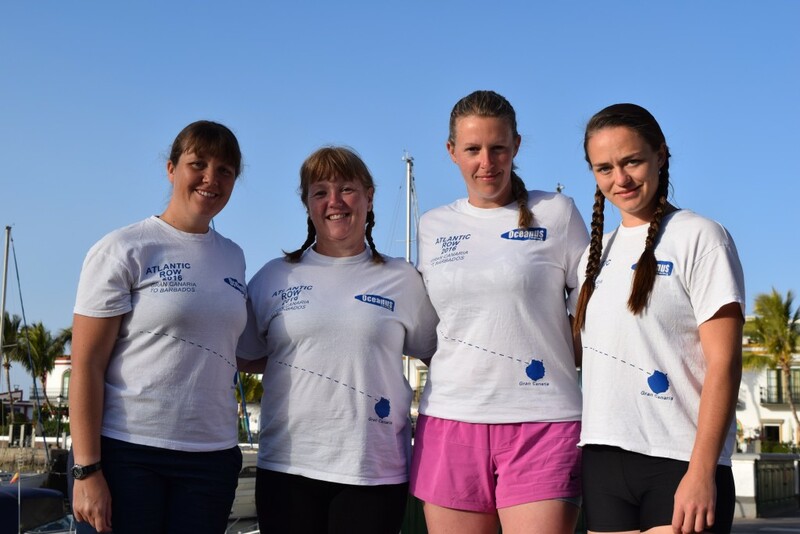 The girls on Fire Ant continue to make very good progress towards Barbados, well ahead of record pace for an all female crew. 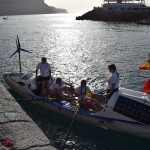 In the last 24 hours they have travelled 72 nautical miles. Favourable weather looks set to continue for both crews for at least a week. The Ladies crew on board Fire Ant have had a solid first 24hrs at sea. As those dot-watching on the tracker will have seen they were getting pushed around a bit between Gran Canaria and Tenerife. This area is known as the acceleration zone. Waves and wind are funnelled between the islands and conditions get a little choppy. 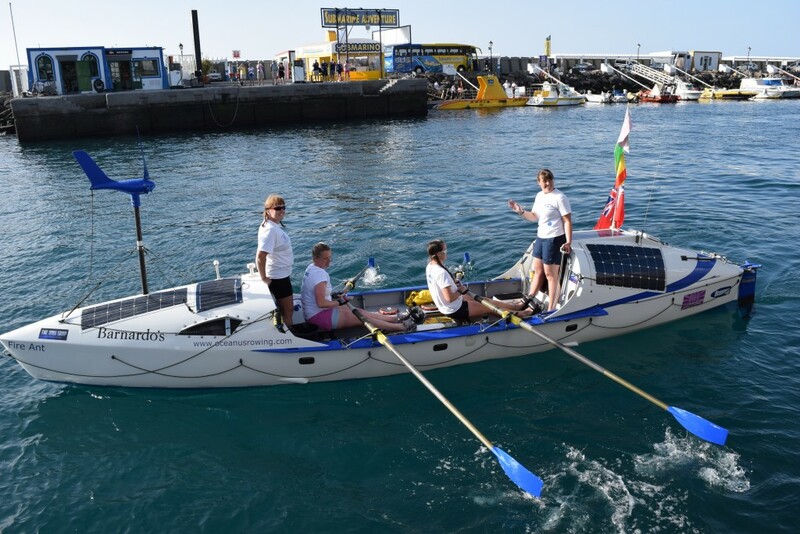 But the girls have come through the worst of it in short order and are making good speed toward Barbados. Distance travelled in the last 24 hours is 48 Nautical Miles (Nm). This is a very respectable pace for this region of the route and especially as they were able to cross the acceleration zone almost perpendicular to the prevailing conditions. I spoke to the crew overnight and they are all in good spirits. The morning sun and increase in speed over the last few hours will no doubt make them even happier. With the four girls of the Fire Ant crew now on their way to Barbados the crew of the Toby Wallace make final preparations for launch and departure. 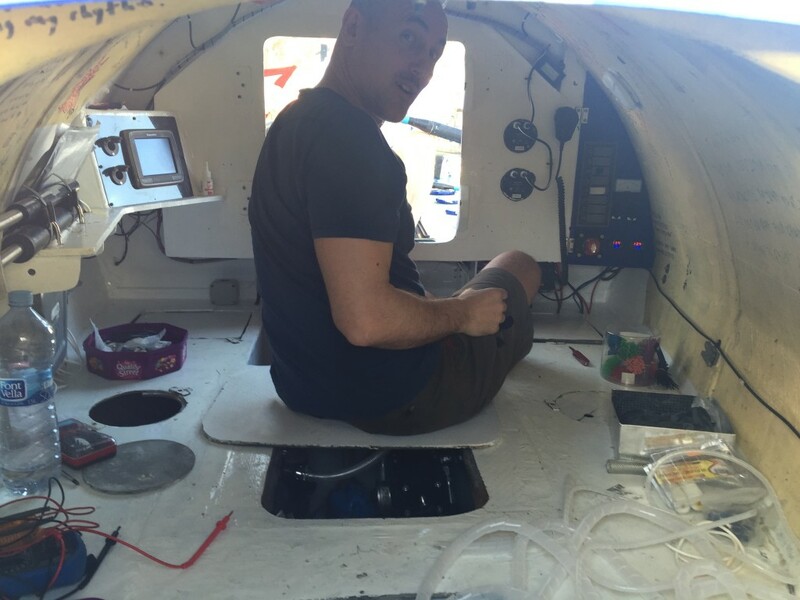 The 8 crew are working together – polishing the bottom of the boat for improved performance and loading food and equipment. 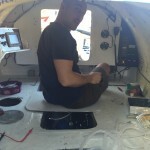 It is hoped the boat will launch tomorrow. Shake-down rows and crew training permitting, conditions are looking good for a departure as early as Thursday evening. At 1000 hrs Tuesday 26th January the crew of Ocean Rowing Boat Fire Ant left Marina Puerto De Mogan and their journey across the Atlantic Ocean to Barbados. 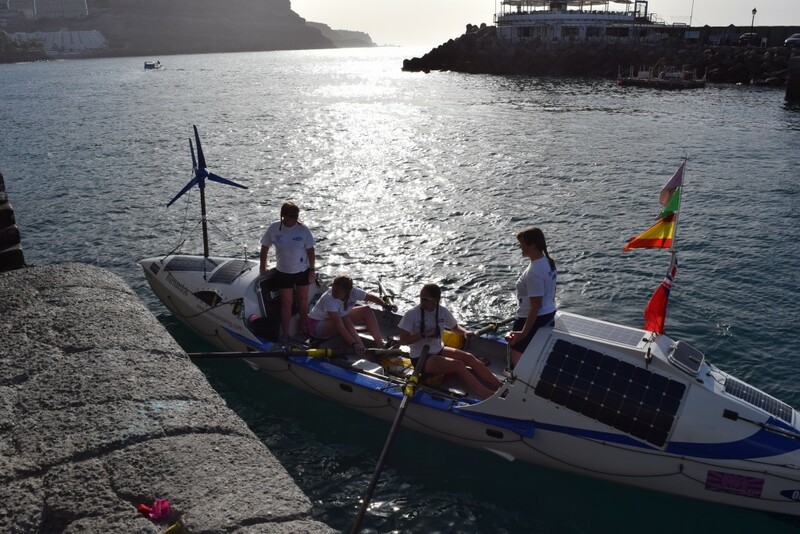 After a hearty breakfast and gathering for photographs and final farewells the 4 girls made a few last minute adjustments to the boat then rowed out of their mooring. 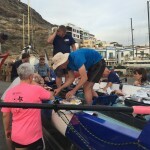 After one final touch of the marina wall for a timing mark, they turned for open sea and away from the Island of Gran Canaria. 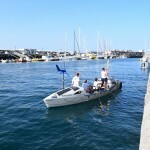 Weather conditions today are beautiful for the start of their row, a bright sunny day, with light wind and calm seas. As they leave the shelter of the island the wind and sea should build slightly behind them to help them on their way.